Keshan Adaru, an outspoken man of unearthly charms, welcomes these changes. All his life he has foreseen an uprising that will shatter the castes and end the tyranny of the old laws. His visions have driven him but now, at the brink of their fulfillment, he finds himself obsessed with Prince Jandu Paran-- a man whose entire family must be destroyed if the kingdom is to be freed. 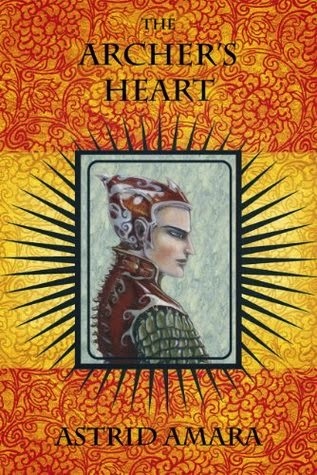 After re-reading The Arche'rs Heart I think I fell in love with it even more. Considering I thought this book was one of the best I had read in 2014, this was quite an achievement. The Archer's heart is such a pleasure to read. This beautiful fantasy novel draws on elements of the Mahābhārata and is set in a land, not dissimilar to India, called Marhavad. It is a tale of caste, magic, betrayal, adventure, war and love. I spent a week rushing off to bed early just so I could read more! After I read it on my Kindle I had to buy it in paperback, even though it is now out of print, am so glad that I did.This book deserves to be read in paperback. The Indian influence that saturates this novel is beautiful, and a nice change, as most fantasy books I have read have European roots and groundings, and so this epic novel was a breath of fresh air. Astrid Amara builds this world beautifully and with the magical elements that blend seamlessly with the historical feeling of this novel, it is truly a rare gem of a book. Prince Jandu Paran, may seem at first a spoilt brash boy, but don't let this deter you. He may be ignorant of the problems plaguing his country but this novel is all about his journey as he grows into a man who is strong and worthy of his title, with the help from Keshan Adaru. Keshan is a man who is gifted with The Sight and therefore change is at the forefront of everything he does. He is determined to abolish the caste system and have all men and women equal in society. He is charismatic and beautiful and the romance between Jandu and Keshan was one of the reasons why this novel works so well. This book will always have a very special place in my heart, as I don't think I can explain how much it moved me. The Archer's Heart is unique and beautiful with excellent world building and lyrical text. I would recommend it to everyone who enjoys historical romance and a love story that will always be with you.